Drive investigated Koenigsegg's latest technology called Free Valve Technology, which basically allows the engine head a number of major advantages over traditional Camshaft and Valve Technology. 20% improvement in fuel efficiency, can be retrofitted to most second hand cars. Plans to use engine as air compressor in the future for boost and power regeneration. 2,500 rpm truck valve or 15,000 rpm motorcycle valve, up to 20,000 rpm if necessary. Individual control of each valve making possible square opening response curve to allow better air flow. Actually results in less weight on engine. Can be retrofitted to any car with valves. No camshafts at all - 'nuff said. Someone needs to step up and put this on an RB26... or an RB30, someone who's done some Awesome things with engines before like R.I.P.S. 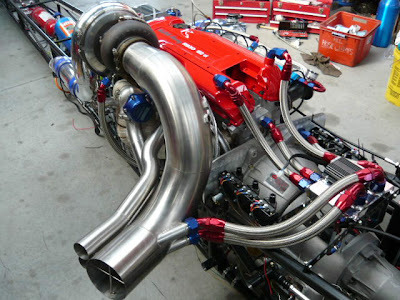 Racing and their RB30DET Dragster, or Spool Imports and RB34DET 1,070 AWhp R34 GTR.